Try This Fun and Easy Menu for a Taco Bar! 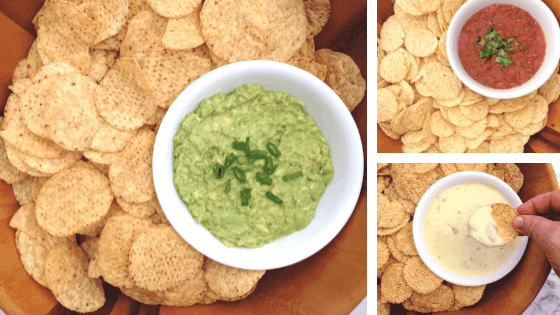 Need help planning food for Cinco de Mayo or your next Mexican party? 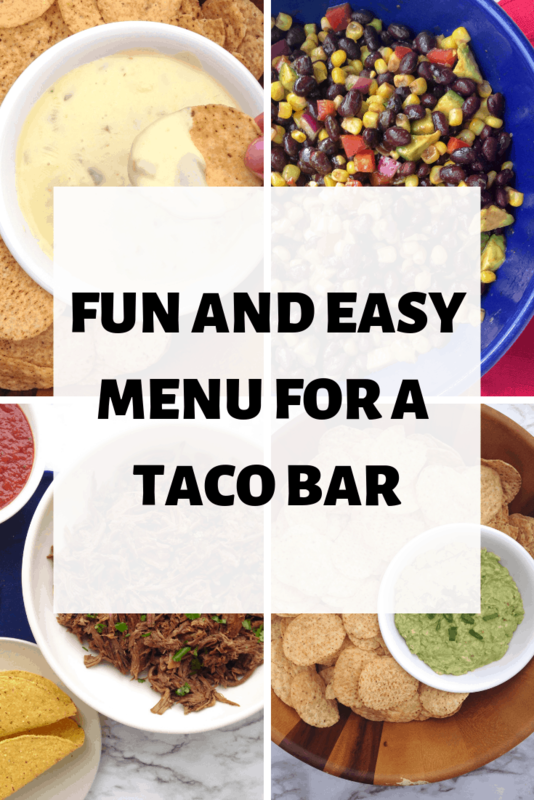 Today I’m sharing with you a fun Taco Bar menu that your guests will love — along with all the recipes you’ll need PLUS a downloadable Taco Bar Timeline and Grocery List! This timeline breaks down all the tasks you need to do to get ready for a Taco party and helps you plan ahead so that you can actually enjoy time with your guests instead of running around heating things up at the last minute. They are easy to put together! Almost everything can be made ahead, and while there are typically a lot of the ingredients on a taco bar, a lot of them are store-bought. Taco bars are a great way to accommodate all kinds of people — from picky kids to vegetarians, everyone can make their own plate just how they want it. They’re great for delegating. If you want to make your taco bar a potluck, everyone can just pick 1-2 things to bring, and it’s as easy as that! The recipes in this menu are tried-and-true — they’re some of my favorites, and I use them often when we have large groups over. Make this menu yours and have fun! Try one of the appetizers in this post: 15 of the Best Mexican Party Food Ideas! 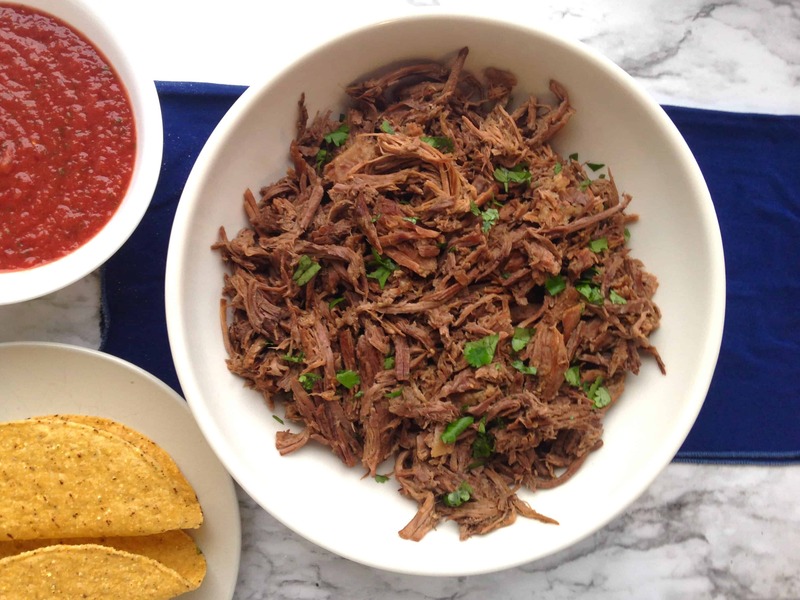 Instant Pot Mexican Shredded Beef (with Slow Cooker instructions) — so EASY and delicious! Just dump it in, let it cook, and shred it up. Sauteed Vegetables from Pioneer Woman’s Dinnertime Cookbook — a delicious mix of zucchini, squash, bell pepper, and jalapeño. This Tres Leches Cake from Allrecipes makes for a great ending to your meal and has tons of great reviews. Whenever I’m hosting a big group, I like to make a menu prep timeline/plan to keep me on track and to make sure I haven’t forgotten anything. This timeline makes the most of prepping ahead and working in the pockets of time you have while cooking. Download this timeline and a free grocery list below!! If cooking this in the slow cooker instead, put it in at the beginning of the day! This plan and timeline will help take the stress out of your taco bar! Arrange your food in the following order: bases, meat, beans, veggies, toppings, and dips. If someone asks what they can bring, let them choose a base or a topping. The more people who bring something, the easier it is on you! These themed taco paper plates are too cute. Use these taco holders to help keep things less messy. And to add a pop of color and festive-ness, use this plastic tablecloth! If you’re looking for some DIY Mexican decorations, this video has some really cute ideas with some things you may have around the house or can pick up at the Dollar Store!! Whether you’re celebrating Cinco de Mayo, a birthday, or are just in the mood for a fiesta, taco bars are a great way to feed a crowd. And this menu, Taco Bar Timeline, and downloadable grocery list will give you everything you need to make sure yours is memorable. If you liked this post, you’ll LOVE 15 of the Best Mexican Party Food Ideas and 13 Charcuterie Board Ideas for Easy Entertaining!